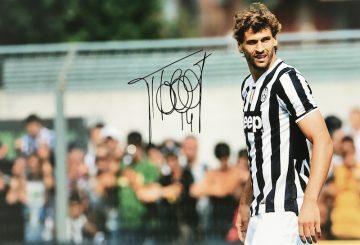 Browse our signed Juventus memorabilia with autographed items from the players. Signed Juventus shirts, footballs, boots and photo displays. 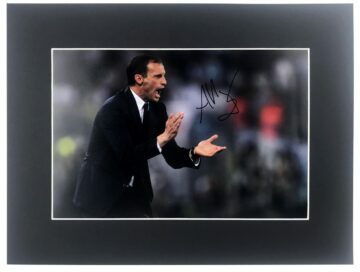 All of our autographed Juve FC merchandise comes with free UK delivery and fast worldwide shipping. Many come with a photo of the actual signing! Turin-based top-flight Italian team Juventus FC are known all over the world for their determination and drive. After starting out from humble beginnings (the club was founded by Torinese students in 1897) they have consistently competed with success in national and European tournaments. Affectionately known as ‘Juve’ or ‘Vecchia Signora’ (The Old Lady), their thirst for success and score sheets have remained largely unchanged over the years. Even the black and white striped kit they are known for has been around since 1903. Juventus have won a whopping 34 league titles in total. They have also claimed 13 Coppa Italia and 7 national Super Cup titles, making them record holders for both competitions. On the European stage they have also proved formidable – 2 Intercontinental Cups, 2 UEFA Champions League titles, 3 UEFA Cups and 2 UEFA Super Cups. Achievement clearly is everything at Juventus – and their thirst for success is reflected both in the size of their fan base (known to total around 12 million worldwide) and their bank balance. The club was estimated to be worth $850 million, turning over $272 million annually, more than any other Italian club. Meanwhile, it boasts the largest fan base in Italian football – and one of the biggest followings worldwide. Many of the Italian national team players are sourced from Juventus, leading them to international success in the World Cup. 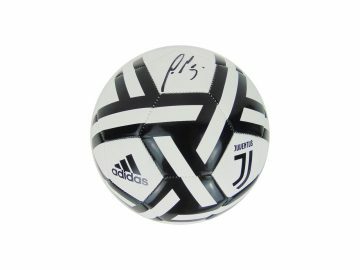 Looking for genuine signed Juventus football memorabilia? Here at Firma Stella quality and authenticity guide our approach. Our collections feature a wide array of diverse and often exclusive items, sourced directly from clubs and players themselves or from trusted partners. Browse our collection to find signed Juventus shirts, clothing, footballs and photographs autographed by some of the club’s best-known players and squads.